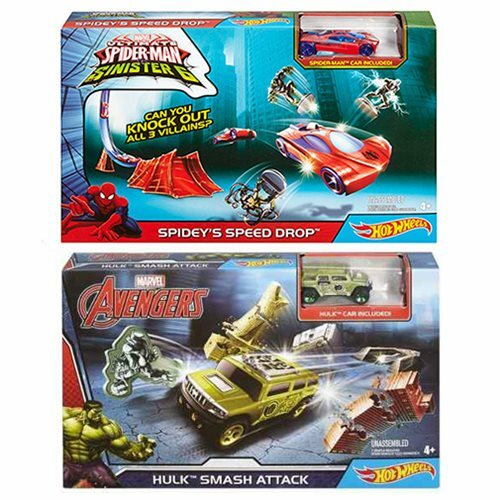 Celebrate Marvel's animated and movie worlds with Marvel Hot Wheels Hulk and Spider-Man Playsets! Each playset features heroes and villains from Ultimate Spider-Man vs. Sinister 6 and The Avengers Assemble. Bring the Marvel characters and action to life with unique tracks, themed villains and heroes, and a featured Hot Wheels vehicle. Create your own Marvel universe with the Marvel Hot Wheels Hulk and Spider-Man Playset! Not for use with some Hot Wheels vehicles. Additional vehicles sold separately. Ages 4 and up.